Bethel Heats Up with SummerFest TOMORROW! All tapped out? 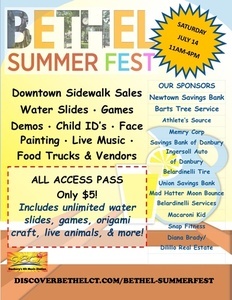 On the heels of BeerFest comes Bethel Chamber SummerFest - tomorrow! Bethel SummerFest will take place on July 14, 2018 from 11am - 4 pm. Preceding Summerfest will beBeerFest on Friday, July 13. Summerfest promises music, food, fun and more! There will be sidewalk sales throughout town and the Municipal Center lawn will be home to a splash fest area with water slides, a petting zoo, vendors, life-size games, and shows! The event is FREE for all to enter, but select special activities cost a nominal fee. Purchase an "All Access" pass for attractions: water slides, games, free origami craft and more.